Club Med Punta Cana in the Dominican Republic has a great ambiance and outstanding kids' programs. Baby Club Med takes infants from 4 months to under two years old; Petit Club Med is for two-year-olds and three-year-olds. And, Mini Club Med has dedicated areas for several different age groups. Much of the time, the kids are out and about doing fun activities or enjoying a big playground and kiddie pool by their kids' club. Older kids might work on their trapeze skills, or rehearse for the Mini Club show that's staged every week with costumes, lights, and sound. Where you won't find kids is in a room with video games. Meanwhile, tweens and teens can head to the Password area that's exclusively for two age groups: 11 to 13 years old, and 14 to 17. And, of course, there are plenty of activities for grown-ups, too. Club Med is a unique brand of all-inclusive resorts, due mainly to its "G.O.'s." This and other Club Med signature features are what puts this resort on our list. Jamaica is an island known for all-inclusive resorts for families, and all of them offer kids clubs, water sports, kids' meals. But Franklyn D. Resort takes "all-included" a giant step—each family has its own "vacation nanny" during their stay. Many families request the same nanny year after year. She'll play with your child, take him or her to the kids club or arts and craft center, or to other activities. Or if you prefer, she'll hang out with you and watch toddlers in the pool while you relax, and so on. Other features at Franklyn D. Resort include large suites, kids club, a 100-foot waterslide, water sports, and scuba for ages 10 and up (at an extra charge). Beaches Negril has many features expected of the Beaches brand: kids programs for many age groups, including infant care; activities and live shows featuring Sesame Street characters; cool teen and tween programs; state-of-the-art gaming center and all-included scuba for ages 10 and up; butler service (with certain suites); and more. Beaches is a brand of family resorts that are part of the Sandals all-inclusive resort company. The Beaches resort in Turks and Caicos is a popular spot and is often fully booked even in summertime. Guests are drawn by the white-sand beach and the turquoise sea with coral reef, and also by the nursery and kids programs; the Pirate's Island kid center with a giant pirate ship and water slides; and by Beaches' partnership with Sesame Street. Cookie Monster and pals are on-site for meet and greets, live shows, and special activities. Other features include a state-of-the-art game center, and (included) scuba for ages 10 and up. Add in five pools, nine restaurants, and a European spa—and if that's not enough—well, you can sign up for Butler Service. Turks and Caicos, by the way, is a group of small islands halfway between Florida and Puerto Rico. First, the Sunscape Curacao Resort is on the Dutch Caribbean island of Curacao, a 2-1/2 hour flight from Miami (and out of the hurricane zone). 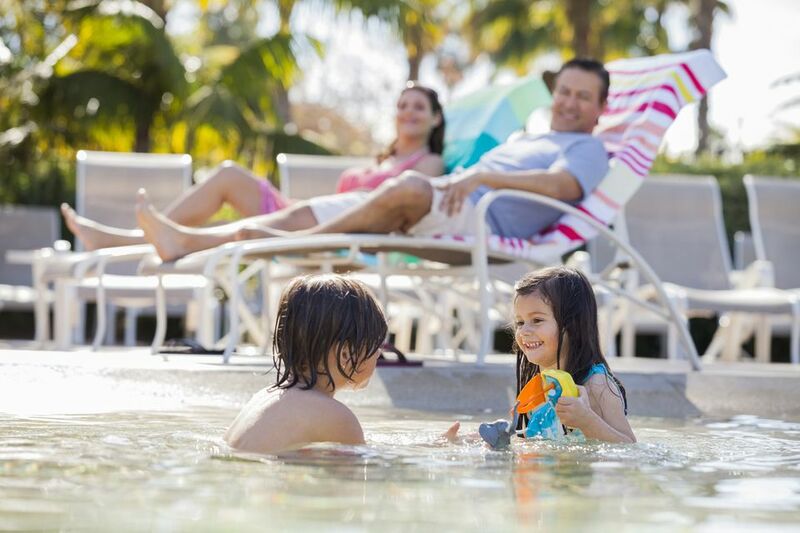 The Hard Rock resort opened as the first all-inclusive resort in the Hard Rock chain of hotels, and it has 121 acres, fifteen swimming pools, a lazy river, kids club, concierge level, villas and suites available, and much more. Plus, of course, rock'n'roll theming. St. Lucia is in the eastern Caribbean. US visitors often route through Miami, which is approximate 3 hours flying time from St. Lucia. Direct flights also depart from several northeast US cities. Many tourists also visit from the UK. St. Lucia is known for scenic beauty, and especially for the twin peaks of the Pitons in the southwest. The island has jungle and plantations; the sea has coral reefs. The Coconut Bay Resort & Spa has 85 acres including a private adult's only pool and lounge area by the spa. Another plus for families is the resort's location, just five minutes from the Hewanorra International Airport (UVF), on the southeast part of the island. This is a top all-inclusive resort in the Caribbean. The location is on beautiful Bávaro Beach in the Punta Cana area of the Dominican Republic, where the white-sand beach stretches for miles in each direction from the property. Features for families include suites that can accommodate a family of five, and Flintstones theming for kids. A kids club has programs for three age groups, including a Baby Rock Club. On-property fun includes a trampoline, zip line, and an inflatable water slide. Guests who want extra pampering at the Meliá Caribe Tropical can sign up for Royal Service, which brings special amenities such as a pillow menu and access to private beach and pool areas. Beaches Boscobel Resort & Golf Club is on Jamaica's north coast near Ocho Rios. The beach area is small but the resort has a large pool, plus a kiddie pool and the Pirates Island water park. Golfers love the all-included greens fees at a nearby course, and the resort offers golf programs and clinics for kids. Beaches Boscobel also offers all the features of the Beaches brand, including kids programs for many age groups, including infants; activities and live shows featuring Sesame Street characters; cool teen and tween programs; state-of-the-art gaming center; all-included scuba for ages 10 and up; and more. Butler service is available with certain suites. Beaches Boscobel is a 1-1/2 to 2-hour drive from the Montego Bay airport. This all-inclusive family-friendly resort located on stunning Cable Beach completed a $19 million renovation in 2017. The 694-guest room resort has been completely transformed, including 102 rooms that are part of THE LEVEL, Meliá Hotels & Resorts’ elevated service concept. Kids have their own vacation at the Kids Club with indoor and outdoor activities, games, and experiences. There is a full range of activities and entertainment including live music to be enjoyed by all ages. Along with three resort pools and lush gardens, there is a 24-hour fitness center featuring state-of-the-art equipment. This all-inclusive resort in the Dominican Republic is part of the Dreams brand which has properties in Mexico and the DR. Dreams is part of AMResorts, which also has the Secrets brand for couples. Dreams Punta Cana has a beautiful beach that stretches for miles in either direction and is great for long walks or building sandcastles. However the resort's location is more toward the north (Atlantic) coast of the island, and depending on the weather the seas can be too rough for swimming. Meanwhile, the resort has a very long meandering pool that visitors love. Another pool is located at the kids' Explorers Club, which has activities for kids age 3 to 12, and on-site fun such as a pirate ship, castle, theater, snack area, and waterslide. Teens can head to the Core Zone teen center.